We hope you find this site of interest. Since 1996 we have been collecting family information from hundreds of people around the world. We have assembled that information in the Family Tree Database. You can access more than 31000 listing simply by clicking the Family Tree Database button in the menu bar above. In addition to the database, you will find photos in our galleries by clicking on the Pictures button in the menu bar. Many of these pictures were sent to us by folks who found relevant family information in our database. You will also find a number of interesting stories in English and many in Norwegian linked to the Stories button. We hope you will feel free to contact us if you have question about our Website or if you have information you would like to contribute. Feel free to look around and explore the many pages. Our E-mail address can be found at the "Contact Us" button. Vi håper du finner dette nettstedet interessant. Siden 1996 har vi samlet sammen informasjon fra flere hundre personer fra hele verden. Vi har lagt denne informasjonen inn i vår slektsdatabase. Ved å følge lenken til vår slektsdatabase, får du tilgang på mer enn 31000 navn med tilknytning til vår slekt. I tillegg til databasen, finner du vårt fotogalleri gjennom linken "Bilder" på menylinjen. Mange av disse bildene ble sendt oss fra personer som gjennom vår database fant informasjon om sin egen familie. Du vil også finne noen interessante historier, både på norsk og engelsk, gjennom lenken "Historier". Har du spørsmål om vårt nettsted, om informasjonen her, eller du har informasjon du vil bidra med, mottar vi så gjerne en mail. Ta en tur rundt her og kikk på sidene. Våre emailadresser finner du på vår "kontaktside". Click on the poster to get to our Most Wanted TNG page. This is a random photo displayed from the Rønneberg Family Gallery within TNG. Anna Marie sit barndomshjem på Rønneberg i Sola. Bildet er tatt før 1908 og står trykket in Soga om Sola og Madla. Gård på Røyneberg før 1908. Anna Marie's childhood home on Rønneberg in Sola. The picture was taken before 1908 and is in The Story of Sola and Madla. Farm of Røyneberg before 1908. This painting was painted by Per Gjemre. This oil painting was brought by Trygve Rønneberg from Norway. We believe it depicts some of the buildings a few km from the Røyneberg Family farm near Sola. It was painted by Per Gjemre. Seated from left: Odd Nilsen's mother (Mossi), Anna (Odd's grandmother), unknown child, unknown lady, Mr. Enok Rønneberg (brother of HJ), unknown, ms. Stang, - and seated to the far right: H.J. Rønneberg. Standing (back row): unknown, unknown, Harald Rønneberg, unknown, unknown, unknown ,Jens Rønneberg. Chico, CA. Members share their Norsk heritage at the local mall. Recently a new book has been published about the most prominent branch of our Ronneberg family. 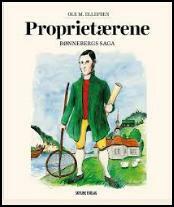 The name of the book is “Proprietærene” loosely meaning “The Business Man. The author is Ole M. Ellefsen and the publisher is the “Skyline Forlag”. Nylig en ny bok har blitt publisert om den mest fremtredende grenen av vår Rønneberg familie. Navnet på boken er "Proprietærene" løst betyr "The Business Man” Forfatteren Ole M. Ellefsen og forlaget er Skyline Forlag. This Website was created for your enjoyment. Permission to use any material or information from this site must be obtained in writing from the Webmaster, Skip Ronneberg. Copyright ©2016. 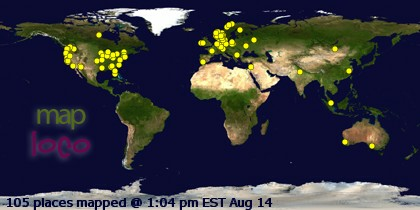 This map shows the location of visitors to ronneberg.org.